Polyethylene glycol polymers are hydrogels that can be used for tissue sealing and adhesion. ■ Polyethylene glycol polymers, completely synthetic and bioabsorbable, are particularly desirable as tissue sealants because inflammatory potential and risk of viral transmission are eliminated. ■ Intact coagulation pathways or the presence of active bleeding are not required to achieve successful hemostasis or tissue sealing. Two products are Food and Drug Administration approved. Focalseal-Lu is a polyethylene glycol-lactide that requires photoactivation with xenon light. The eosin-polyethylene glycol-lactide mixture is first applied as a primer before a macromere of polyethylene glycol-lactide is applied. The latter is photoactivated with high-intensity xenon light. 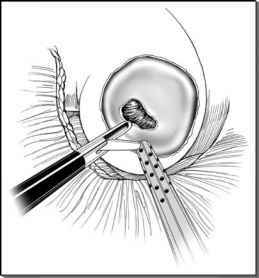 The only experience with the use of polyethylene glycol polymers in laparoscopic urology was a feasibility trial performed by Ramakumar et al. in a porcine laparoscopic partial nephrectomy model (59). After renal hilar control using a laparoscopic Satinsky clamp and wedge resection in either the upper or the lower pole, Focalseal-L was laparoscopically applied to five kidneys. After the removal of the vascular clamp, a control wedge resection was made in the opposite pole in order to confirm viability and perfusion. The authors found that (i) the polyethylene glycol polymer was adherent to the underlying tissue surface; (ii) the bleeding was significantly less in the polyethylene glycol-treated group; and (iii) no urinary leakage occurred during ex vivo retrograde perfusion studies performed at pressures as high as 100 mmHg. Cosealv is another polyethylene glycol polymer combination that received Food and Drug Administration approval in 2003. Unlike Focalseal-L, Coseal does not require pho-toactivation and therefore makes its application potentially less cumbersome. The material forms a flexible, watertight seal that is reabsorbed within 30 days of its application (60). Until prospective clinical trials are performed, the efficacy of Coseal and Focalseal-L in urologic laparoscopy remains uncertain. Nevertheless, synthetic sealants are advantageous because allergic and viral transmission risks are nonexistent and because intact clotting pathways are unnecessary.